It took two people to maneuver the hoist, a third person to stop his body and legs from swinging into the doorway and keeping the towel in place, and a fourth person to carry the ventilator and keep their attention on his mask to make sure it wasn’t slipping. There was a tense moment lowering him into the water and undoing the sling from the hoist but once we had positioned him and he was happy that he wasn’t feeling like he could slip, the nurses left and gave us a bit of time alone. I had to be careful washing his hair, I couldn’t get water near his nose and mouth or get shampoo in his eyes. I took the opportunity to cut his nails while they were softened with the water. He was very trusting. There was an alarm button very near the bath, if I got into trouble or he started slipping I only had to take one step to hit the red button on the wall. It was here we had conversations about the future. Being at the hospice gave us these moments. When we were at home there was always too much to do or too many people around to find a quiet moment to talk and we hadn’t wanted to acknowledge the need for these difficult conversations earlier on in his progress when we had more privacy. He told me I would meet someone else. He didn’t tell me he wanted me to meet someone else, just told me as fact. I think it was the only way he could talk about the subject. I knew the thought of another man bringing up his child was heartbreaking for him, it was heartbreaking enough for him to watch his friends push the swing and be the ones to make Oscar laugh. He couldn’t do much to entertain a one-year-old while sitting motionless in a chair, and it was difficult to think of ways to make Oscar interact. These are the little things that make MND earn it’s title of ‘cruel’. Neil also knew that Oscar was too young to develop memories of his father or his decline. He had to trust that I would put Oscar in good hands, and I remember his words being: ‘Just make sure he’s not an arse!’ For this he managed to muster up one of his cheeky smiles, rather chuffed with himself that he knew I would remember his final words on the matter. I phoned ahead one day at the hospice to say that Oscar had started walking properly and asked if they could push Neil up to the window to see him walking from the car. The night before Neil went in to the hospice, Oscar had taken a hand away from standing at the sofa and walked across the room to the door. Unfortunately, Neil hadn’t been facing in the right direction to catch it, and no matter how much I encouraged Oscar, he wouldn’t do it again. I had bought Oscar a little children’s rucksack in the style of a turtle shell to help him walk as he was also going through that annoying little phase of not wanting to hold my hand. 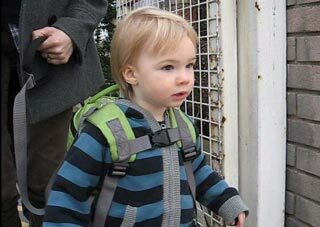 The little rucksack worked wonders and gave Oscar the confidence to start walking. I’ll never forget how proud I was walking Oscar from the car with Neil watching at the window and a circle of nurses around him all smiling. Welcome home, Neill! I’m sure everyone’s happy to be together under one roof again. Do try to bathe regularly, though, won’t you?? ..Glad to be home? There is no place quite like it! Glad to hear that you have resolved your advanced directive. Do let us know what is happening. It’s interesting stuff, especially with such a delicate and important issue. Now you can enjoy every day that you have with your family without having to worry about it. Take care all of you, Love as always. Glad you’re home, mate. Hope everyone got a break. Will trot down soon to pilfer your Bassetts stash. Uncle Mel & I are so pleased you are back home where you belong – thought! how about a hot tub on the patio with marquee round it, we could all join in and have a drink!!!! I’m off to Colombia next week. Can I bring anything back? A kilo?! We are so pleased to hear the situation has changed and you are more in control again. I hope this will help you to relax and enjoy being back together all the more, especially with Oscar on the move – that little boy is such a blessing. Damn i didn’t get chance to throw you down the hospice clothing chute !! somewhat concerned about all the empty guiness cans i saw on my recent visit. either you havn’t changed your drinking habbits or there are some very drunk carers around. glad your home sunshine. Do you remember me. Ive changed lots of your nappies in my time. Hahaha! I just wanted you to know that I am thinking of you with utter admiration, every day. I wish you love and peace and also your lovely wife and,not forgetting Oscar.